Uwharrie National Forest, headquartered at Troy, is one of America's smallest national forests, occupying a little over 50,000 acres in Montgomery, Randolph, and Davidson Counties in the central North Carolina Piedmont. The youngest of the four North Carolina national forests, Uwharrie was established in 1961 from land purchased by the federal government in 1934 to resettle farmers. It is not one continuous unit but discrete parcels of land separated by privately owned tracts. The Uwharrie Mountains, which form the forest's backbone, give it its name, which, according to legend, comes from the name of an Indian tribe indigenous to the area. These thickly wooded, low-lying ridges are some of the oldest in North America, theorized to have begun as volcanoes on the ocean floor. Some, such as Morrow Mountain, have peaks; but these ancient mountains, worn down from a possible height of 20,000 feet by rivers and time, rise only about 1,000 feet from the Piedmont Plateau. Uwharrie National Forest, unlike the national forests of the mountains and the shore, is a sanctuary of hardwoods, pines, and rocks. Nifty Rocks features huge boulders, some as tall as 15 feet. True to its slogan, "Land of Many Uses," Uwharrie National Forest attracts visitors to hunt game birds and deer, hike on trails such as the Uwharrie National Recreation Trail, and camp and picnic at the Badin Lake Recreation Area on the forest's western border. The Uwharrie Wildlife Management Area covers 13,000 acres and, as a result of stocking in 1945, boasts a large deer population. Rivers and lakes for fishing and water sports abound. 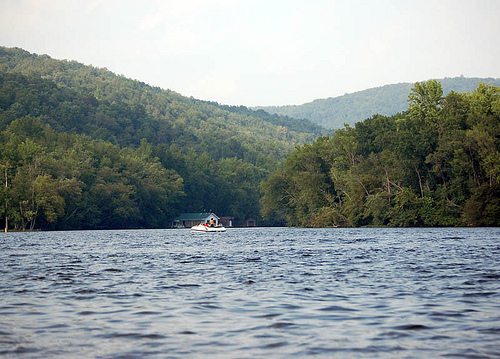 Badin Lake, Lake Tillery, and the Yadkin and Pee Dee Rivers run the length of the western boundary; the Uwharrie River flows through the center of the forest. The rich ecosystem sustains numerous species of wildflowers and shrubs. The nation's first gold rush took place near Uwharrie National Forest in 1799; abandoned mines pepper the area. The Russell Mine, active in the late 1800s, is among the largest. G. Nicholas Hancock, Guide to the Uwharrie Trail in the Uwharrie National Forest (1983). Alan Hodge, "Pint-Sized Paradise," The State 61 (1993). Sharyn Kane and Richard Keaton, Southern National Forests (1993). United States Department of Agriculture Forest Service, Uwharrie National Forest: http://www.fs.usda.gov/wps/portal. "Uwharrie Mountains and Lake Tillery, NC." Image courtesy of Flickr user James Willamore. Available from http://www.flickr.com/photos/bz3rk/2922402119/ (accessed June 26, 2012). 1 January 2006 | Patteson, Angelyn H.